Fanney Khan, Mulk and Karwaan all failed to impress the audience. The fact that either of Fanney Khan, Mulk or Karwaan could have changed the game and raked in the moolah but could not is proof of how disappointing last Friday was. While all three had successful, bankable stars, the movies did not pull in the audiences. First up is Fanney Khan, starring Anil Kapoor, Aishwarya Rai Bachchan and Rajkummar Rao that opened to a disastrous Friday. On its opening Friday, Fanney Khan made a dismal Rs 2.15 crore. According to reports, Fanney Khan did not fare much better over the weekend either. The movie is estimated to have made only an approximate Rs 7.90 crore over the weekend. It is indeed very surprising as the movie not only boasts A-listers but also brings together Aishwarya Rai Bachchan and Anil Kapoor after 18 very long years. A remake of Dutch film Everybody's Famous!, Fanney Khan is directed by Atul Manjrekar. Fanney Khan revolves around Prashant Sharma, a failed musician who wishes to make his daughter the next Lata Mangeshkar. However, the daughter has to face her own demons. The other release of the week was Mulk. 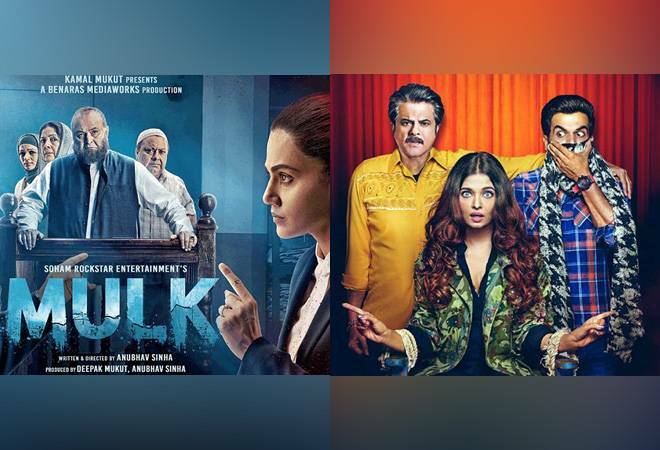 Starring Rishi Kapoor, Taapsee Pannu, Prateik Babbar and Ashutosh Rana, Mulk fared worse than Fanney Khan on its opening day. Mulk earned a measly Rs 1.68 crore on Friday, followed by Rs 2.81 crore on Saturday and Rs 3.67 crore on Sunday. In total, the movie made Rs 8.16 crore over the weekend. Taking the very pertinent issue of communal division, Mulk revolves around a Muslim family fighting to save its dignity and honour as one of the family members is drawn into terrorist activities. Directed by Anubhav Sinha, Mulk got widely positive reviews with critics applauding Sinha's balanced take. While the movie is likely to see a dip during the weekdays, Mulk still has some time to recover before Kamal Haasan's Vishwaroop 2 hits the theatres. The third release of the week was Irrfan Khan-starrer Karwaan. The movie also features Malayalam star Dulquer Salmaan and YouTube sensation Mithila Palkar. While it is Palkar's first movie, it is Salmaan's first Bollywood movie. The comedy revolves around three individuals who set out on a rather unusual journey after a dead body finds its way to a wrong destination. The movie received mostly positive reviews. On the box office front, Karwaan made Rs 1.60 crore on Friday, Rs 2.80 crore on Saturday and Rs 3.70 crore on Sunday, taking its total to Rs 8.10 crore over the weekend. These movies are not only clashing with each other but are also facing competition from Tom Cruise-starrer Mission: Impossible - Fallout. Moreover, with Kamal Haasan's sequel to superhit movie Vishwaroopam scheduled to hit the theatres next weekend, things are not looking bright for Fanney Khan, Mulk and Karwaan. Salman Khan's Sultan to release in China; can it surpass box office record of Aamir Khan's Dangal?